A review copy was received from the publisher. This does not affect the contents of my review and all opinions are my own..
What a strange, strange book. But in a good way. Incidentally, that’s what I always think after finishing one of Will McIntosh’s novels. I’m a huge fan of the author, precisely because his ideas are always so unique and original—and yes, they can sometimes be off-the-wall as well. 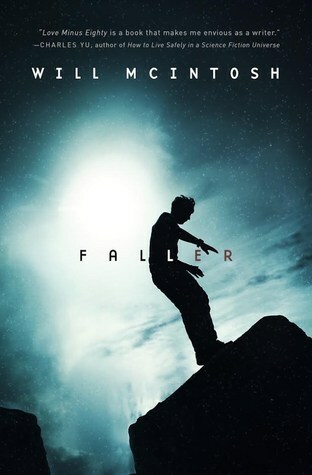 Faller probably isn’t his best work; the writing wasn’t as tight and the story’s many parts were a little incongruous, but that could be due to the book’s subject matter which admittedly is not my cup of tea. As long as you’re willing to accept a wildly unfeasible premise and some logical leaps though, this book is an overall fun time. The story opens with a man suddenly becoming aware of himself while standing in the crumbled ruins of a floating city island. He has no memory of who he is, who his friends and family are, or where he comes from. He has even forgotten how to read. Looking around, he notices other people in the streets, but they all look just as lost and scared as he is. The only clue to the man’s identity are the items in his pocket: a toy soldier with a parachute, a candy wrapper with strange symbols on it scrawled in blood, and a photo showing himself smiling beside a woman he can’t recognize. Before long, the survivors from what has become known as “Day One” are killing each other over the dwindling resources on the island. The weak, including children and the elderly, are deemed a burden and are mercilessly thrown off the edge to die. Our protagonist, inspired by the little toy soldier in his pocket, dubs himself Faller and decides to fashion his own parachute, initially as a stunt to help him and his newfound allies earn food. But unfortunately for them all, his big jump goes wrong, and to Faller’s horror he finds himself accidentally sailing over the edge and into the abyss. Just as he thinks it’s all over though, that’s when he makes a startling discovery. Alternating between Faller’s narrative and flashbacks to the lives of a group of scientists in the months leading up to Day One, McIntosh weaves a twisted tale of a world literally shattered—by war and by warped physics. Faller is a bizarre book and it admittedly requires no small amount of patience if you want to get down to the bottom of this mystery. On the face of it, I can understand why the author decided to structure the novel this way, but it also gave rise to many distractions and interrupts to the flow of both past and present stories. I also found myself more drawn to flashback chapters because that was where you would find the meat of the “science fiction” in this book, while the Faller sections were weirder and more confusing. Still, the mystery was tantalizing enough that at no point did I ever want to stop reading; I knew that the further I got, the more the clues will start leading to answers. However, quantum physics and mechanics have never really been my favorite topic in sci-fi. While I enjoy reading about the science and theory, a lot of books that seek to tackle it often don’t do a satisfying job with the details. This is a problem I ran into with Faller. A lot of the scientists’ experiments and the scientific phenomena described in this book aren’t well explained, and in many instances you just have roll with it. If you don’t mind that a lot of the science is glossed over and rushed, this shouldn’t be too much of an issue. Otherwise, the many plot holes and questions left by logical gaps will make this one tough to get into. But even with its implausible premise, I thought Faller offered a fun and engaging experience. You only have to see how quickly I devoured this book to know that. This is the fourth novel I’ve read by Will McIntosh, and even though it wasn’t my favorite of his, there’s definitely a reason why he will always be on my must-read list. While he admitted in the acknowledgements that this was a challenging novel to write, I’m glad he’s continuing to push the boundaries and experiment with bold ideas. I’ll always read anything he writes. His stories are often of the “big picture” variety, i.e. you can’t focus on the details and instead you have to look at the full meaning of the story. This one wasn’t as impactful as some of his previous books I’ve read though, which is probably why I couldn’t connect with it as much, but you are right, it is very intriguing! Is that a good one to start with? I will be reading it for Sci Fi Month, I am looking forward reading quite a bit, when I requested it I knew very little about it but your review made me want to read even more!